Luckily I had the foresight to get some beers in today but alas I appear to have chosen poorly. The Roscoe’s Hop House IPA was particularly lamentable and the Rams Head IPA by Fordham was forgettable; and while Dominion’s Hop Mountain Pale Ale heralded an upturn in events it still left me wanting. Which is why I was happy when I realised it’s #BeerBods day, especially as this week’s beer is the Pale Ale by Harbour Brewing Co. I don’t know, maybe my ability to taste is shot with all the glorious beers I drank during last night’s festivities at The Duke’s Head in Highgate. What I do know is that I’ve always enjoyed Harbour’s beers and I had no reason to believe tonight’s tasting would be any different. It pours a clear amber with a quickly dissipating thin white head, and the aroma gets you straight away – pineapple and mango in particular. It’s a really well balanced beer with the tropical fruit and citrus bitterness in unison with the sweetness from the malts. It was the standout beer from tonight’s cargo and it reinforces what I’ve often remarked – it’s often better to buy local. I can now add the Pale Ale to the Harbour’s Pilsner, Dunkel Bock and IPA to the get-in-my-face list. Apart from the Christmas tree on the photo there’s nothing particularly festive about this beer, and next year I’ll be doing #12BeersofXmas on Instagram (with more thought given to the beers). But it’s been a blast, and thanks go to The Beer O’Clock Show for making it happen and to all those taking part. Beer people really are good people. 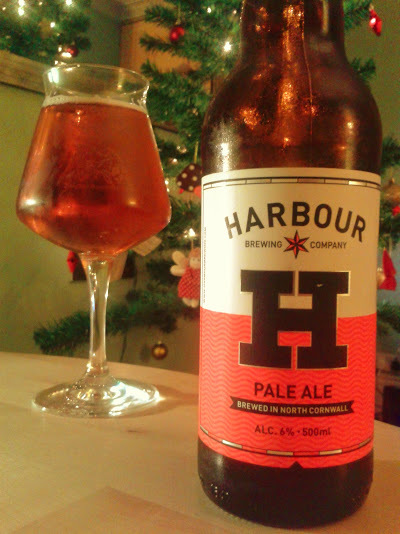 This entry was posted in Beers and tagged #12BeersofXmas, #BeerBods, Harbour Brewing Co., Pale. Bookmark the permalink.